Royal Clouds Review 2019: Is Royal Clouds a Good Hosting? Royal Clouds is an Indian website hosting company with servers located in Los Angeles, U.S.A. They have a solid uptime guarantee and excellent customer service. Indian web host Royal Clouds was founded in 2014. They offer a wide selection of hosting services from servers located in Los Angeles, U.S.A. Their main website is in English, with a plugin on the knowledge base pages to translate to almost thirty languages. Unlike many hosting companies, the excellent 99.9% uptime guarantee is backed by a service level agreement. Royal Cloud’s servers use enterprise-level RAID 10 SSD storage for faster disk read speeds. They also use the high-performance, secure, and easy-to-use LiteSpeed WebServer (to handle thousands of concurrent connections with a small memory footprint) and LiteSpeed Cache (to cache static content and improve performance for websites with high traffic). In terms of value-adds, the hosting packages come with the popular cPanel control panel plus the premium Softaculous one-click installer for more than 150 programs. They also support PHP (versions 4.4 through 7.2), and a free CDN to sweeten the deal. Given the support for cPanel/Softaculous and PHP, I’m somewhat surprised that they don’t provide a website builder and don’t support other advanced coding languages. There are five shared hosting packages called Starter, Economy, Deluxe, Ultimate, and Expert. Their inclusions range from 10 GB disk space and 100 GB bandwidth to 100 GB disk space and unlimited bandwidth. Royal Cloud’s shared hosting prices are okay; not too expensive, and not too cheap. Since the resource caps are quite high, most website owners will be fine with the lower priced packages. While SSL certificates are included with all plans, domain registration costs extra. They offer a good selection of contract lengths, from one month to thirty-six months, and the prices reduce quite steeply when you pay for a longer term up-front. Although it’s not obvious on their website, this company’s terms and conditions include clauses for a 30-day money-back guarantee for shared hosting and a 7-day money-back guarantee for VPS plans. 24/7 technical support can be obtained by telephone, ticket, email, and live chat. My one small gripe is that I have been left waiting for longer than the advertised one minute response time when using live chat, but otherwise I have found their support to be excellent. Their website includes a large knowledge base and a small video tutorial section. Royal Clouds is an Indian website hosting provider with servers located in America. They provide a comprehensive range of services, an excellent uptime service level agreement, and 24/7 support. Check out Royal Clouds’s web hosting options today! 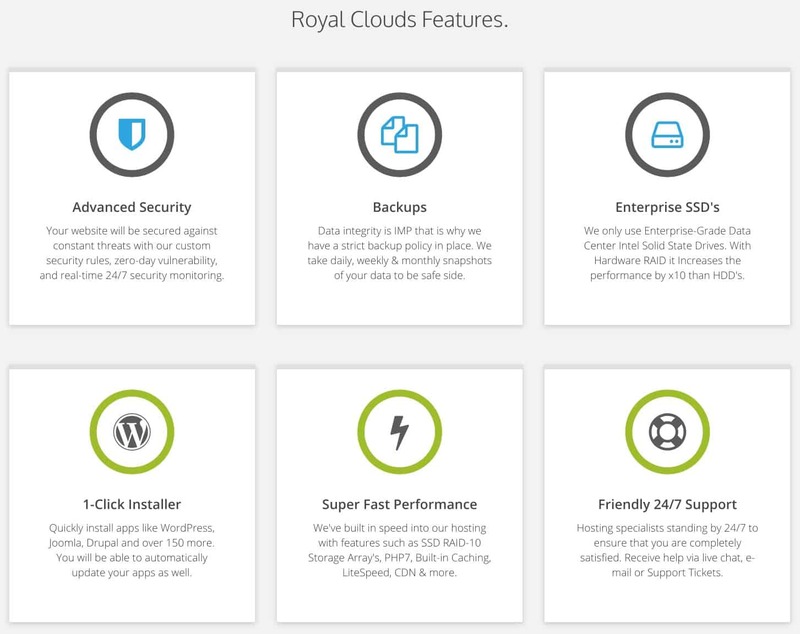 Wondering how Royal Clouds stacks up against other Web Hosting companies? Enter any other Web Hosting company and we will give you a side-by-side comparison.